The Edison Language Academy is a Dual Immersion Elementary School, where all students learn to understand, speak, read, and write in both English and Spanish. Located in the Santa Monica Malibu Unified School District, the school is the first step in a program that allows students the opportunity to continue to develop their language skills from Kindergarten through 12th grade. As the school has grown, so has the need for a reconfigured campus. The project consisted of a new 27 classroom kindergarten through fifth grade facility for 470 students. Facilities include 35,000 square feet of classrooms and 22,000 square feet of administration, library, and cafeteria space. The new facility called for a new stormwater system to capture runoff from the new building’s roof and other impervious surfaces to meet local stormwater regulations and reduce potable water use for irrigation. 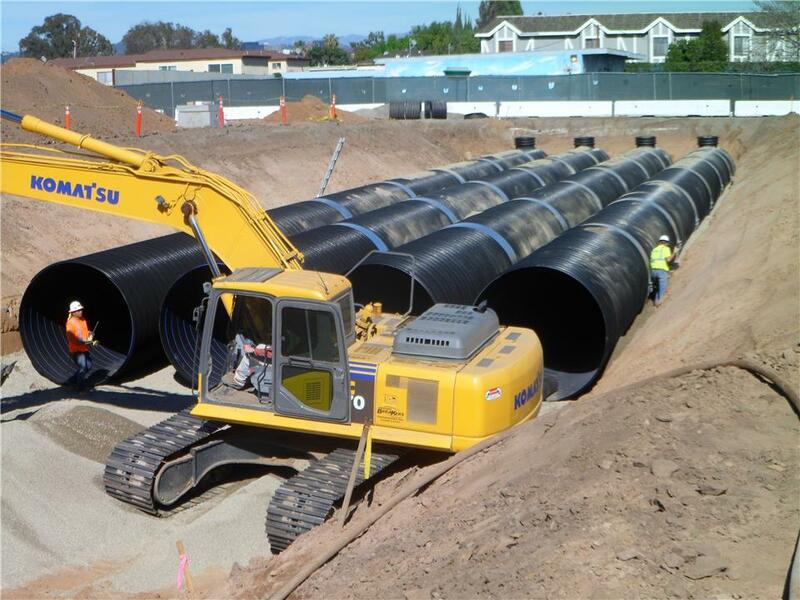 Engineers with KPFF worked with Contech to design a RWH cistern for the site. KPFF has worked with Contech for years and understands the value Contech brings in engineered designs, local regulatory knowledge, and customer service. Contech provided sizing, layout calculations, and installation estimates to help the engineer better analyze the best long term cistern solutions for the site. The cistern was made from 824 feet of DuroMaxx Steel Reinforced Polyethylene. The cistern consists of four, 96" diameter, 206' long barrels providing 300,000 gallons of storage. A VortSentry HS hydrodynamic system was placed upstream to prevent trash, debris, and sediment from entering the cistern. Pretreating stormwater prior to storage in the cistern protects downstream pumps, filters, and fixtures from damage or clogging, and lowers cleaning and maintenance costs by keeping pollutants out of the cistern and mechanical system. The project had to be completed in two phases so to minimize the disturbance to the operation of the school. Contech had to design the RWH system to reduce costs and to design around the aesthetic requirements of the track. In the end, Contech reduced the cost of the system to meet financial requirements, provided a reliable system with ease of installation, and supported the contractors throughout the entire installation process.